Even though Chaiwat was able to reveal his identity later in life, many LGBT disabled people are still struggling between themselves and what their society asks them to be. Paradoxically, they tend to be considered merely as ‘disabled people’. Society normally doesn’t even think whether they’re gay or not. Thai society still doesn’t care much about this hidden issue, although the public has started accepting disabled people and it’s now changing into a so-called barrier-free society. The public may not consider the gender identity of the disabled as a problem, and even worse the disabled tend not to open their mouths for fear of being condemned. Kloyiam said that Thai society particularly doesn’t accept things that are not standard, so it blocks the disabled from opening up about their sexuality. Although Chaiwat was able to come out bravely, it doesn’t mean everyone can be as strong as he was. Society isn’t yet ready to think about the gender identity of people with disability, while they are accepting of LGBT people and disabled people separately. People don’t expect the two to come together. This is obvious from Chaiwat’s experience. Chaiwat himself was able to come out to his friends, but still can’t tell his parents he’s in fact gay. 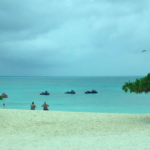 What Kloyiam said is true now: Conservative thinking keeps people’s mouths shut. But does this hidden issue affect only the LGBT disabled? Looking carefully, what’s inside Chaiwat is probably same as non-disabled LGBT people. That’s one of the reasons why he says he isn’t different from others. What makes the difference is a society that tends to classify people as normal or abnormal. “I can say the biggest issue that the LGBT disabled have here is that they can’t come out to those who still discriminate against anything unusual; I mean they are old-fashioned. And this is exactly what non-disabled gay people need to figure out too,” said Chaiwat. Even so, it’s still true that disabled people have more handicaps than non-disabled people when they are LGBT. Some of them have no chance to get advice about their lives. Chaiwat said that this is because there are few opportunities for them to do so. Two years ago in August, Chaiwat, as founder of an organization called DTRC, the Deaf Thai Rainbow Club, organized a progressive event for LGBT deaf people in Thailand. 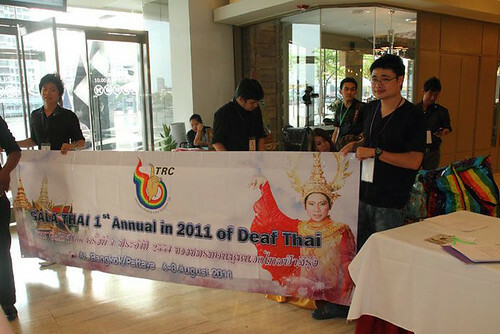 This event was called Deaf Thai Gala 2011, and aimed to allow LGBT-deaf people to exchange ideas and to prevent HIV. It was the first and biggest event ever to happen in Thailand for LGBT deaf people. It was actually inspired by an event held in Hong Kong in 2009, also for LGBT-deaf people, and many foreign participants enjoyed sharing their experience. Thanks to this kind of grass-root effort, ‘old-fashioned’ people also start gradually changing their minds because the LGBT disabled have a certain entry to a better society now.